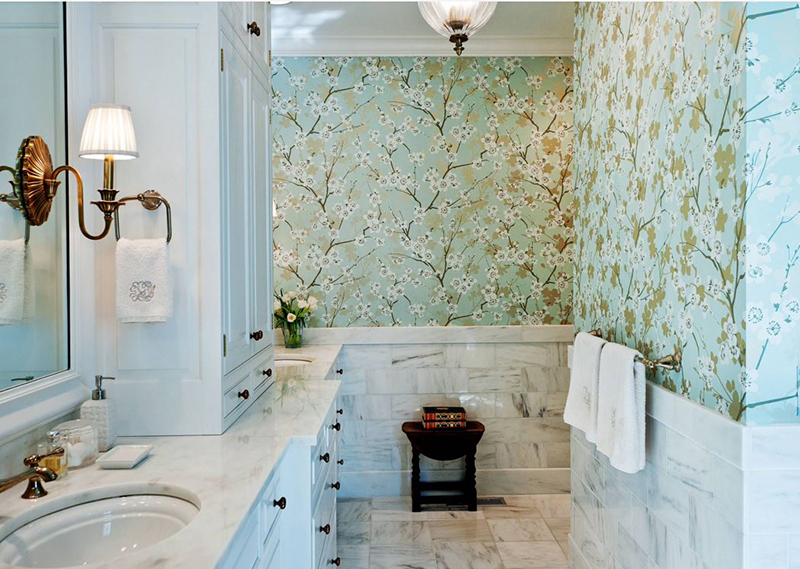 Planning to add wallpapers to your bathroom? You'd be inspired with this list. Wallpapers in bathroom does not sound so ideal to some. Some may think that it is just another waste of cash and would not last a long time anyway, so why bother? I get you, I really do. I mean, why would you put on paper on your bathroom wall for it to be washed and eventually peel off, just like that. The argument here is substantial and very valid because we are used to wallpapers that could peel or washed off easily when wet or when exposed to steam. However, good news is there are also special types of wallpapers that are made for bathrooms- these are those water resistant wallpapers. There are also washable wallpapers and those are all available in the market, online or in your favorite shop. You could also go for the solid vinyl type of wallpaper, which is the most durable type of wallpaper by the way because of its non-absorbent quality and it has no holes that water or humidity can penetrate. These wallpapers have tons of designs to choose from like those of the ordinary wallpapers you used to know. In today’s article, I round up 20 Stylish Bathroom Wallpapers that are sure to liven up your space. Each wallpaper is unique and has its own character that will suit your delicate taste. It ranges from funky, to retro and even whimsy. The designs are all beautiful. The classy and traditionalists can also indulge and pick their favorites. The cool and hip, modernists would love some of the beautiful patterns and textures, too. 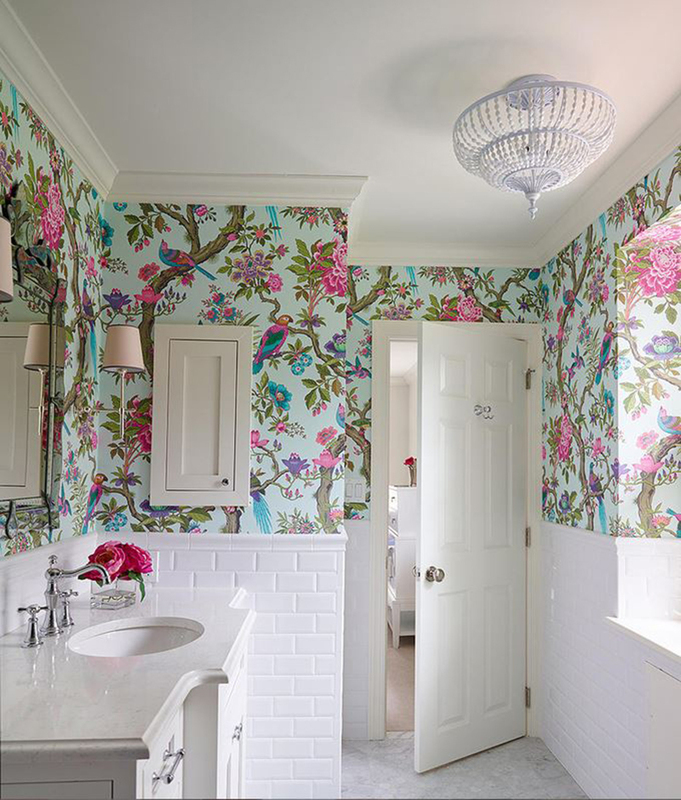 Read on and take a look for you how these wonderfully bathrooms adorned in wallpapers can change your perspective. Keep it light, simple and glamorous! This Island Ikat wallpaper from Thibaut create a fun, bright and exciting aura while the surprising element of a chandelier inside this small room completes the shabby-chic look. 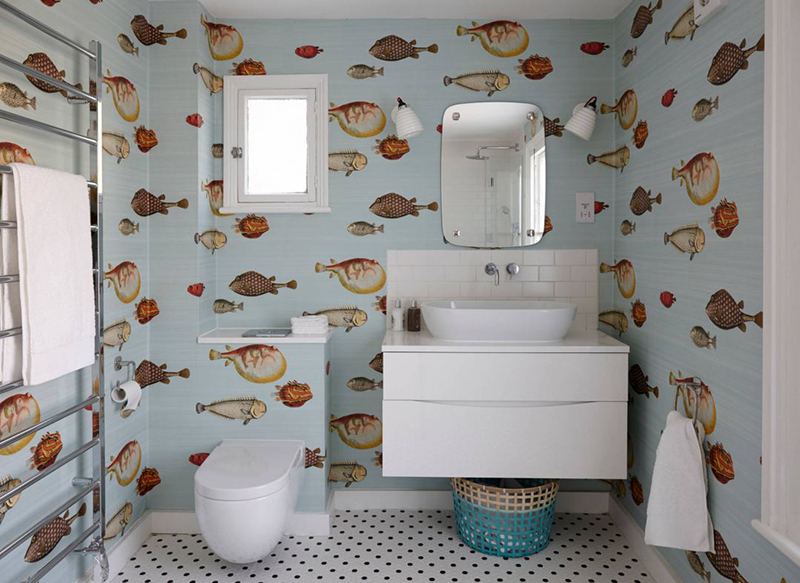 Quirky and fun, this under-the-sea-themed wallpaper features different kinds of fish swimming in different directions. Its lively design is perfect for any beach style bathrooms or children’s rooms. 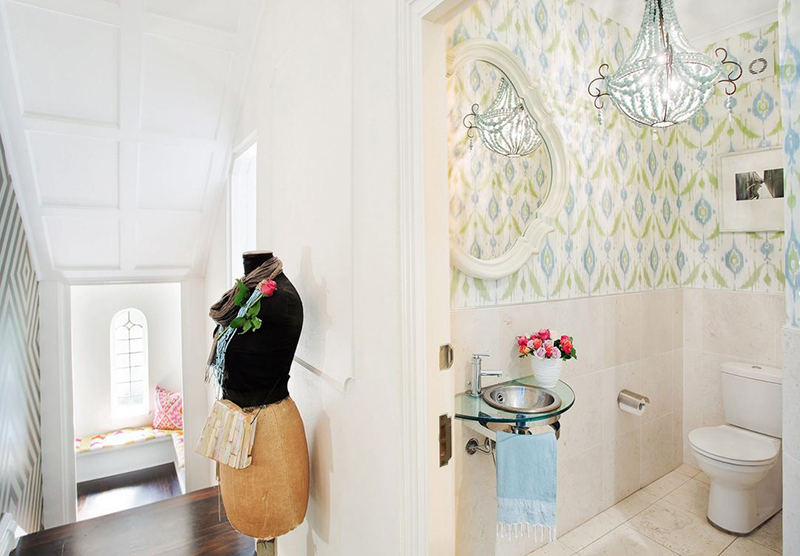 This bathroom has a mix of contemporary and traditional elements in it. The blue and white damask wallpaper gives a Victorian touch while the architectural design of floating shelving and glossy surfaces and wood finish bring contemporary elegance. 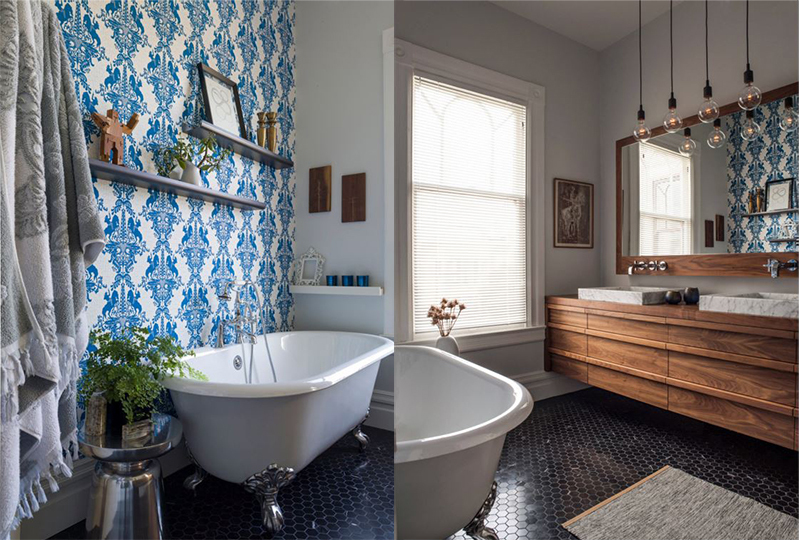 Add personality and unique look to your bathroom with this edgy, Brooklyn tiles wallpaper from Holly’s House. I love the rusty and stylish look, it balances out the clean lines and soft edges of this contemporary space. 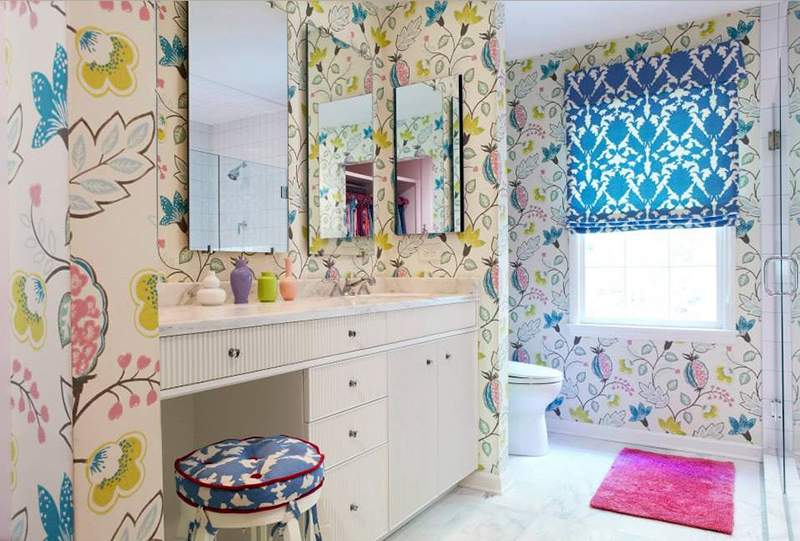 Create a striking, fun and chic bathroom statement for your little girl with this lovely wallpaper. The pops of pastels on the patchwork did the job of making it fabulous. 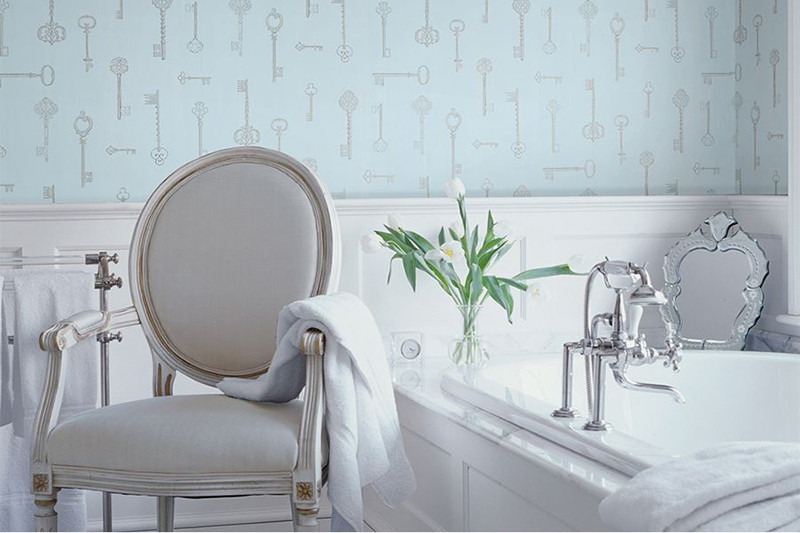 This Victorian inspired wall covering in light blue and silver keys, brings an inviting vintage look that is both elegant and chic. The geometric pattern and the silver and black combination is a great way to add boldness, personality and contemporary feel to this small bathroom. 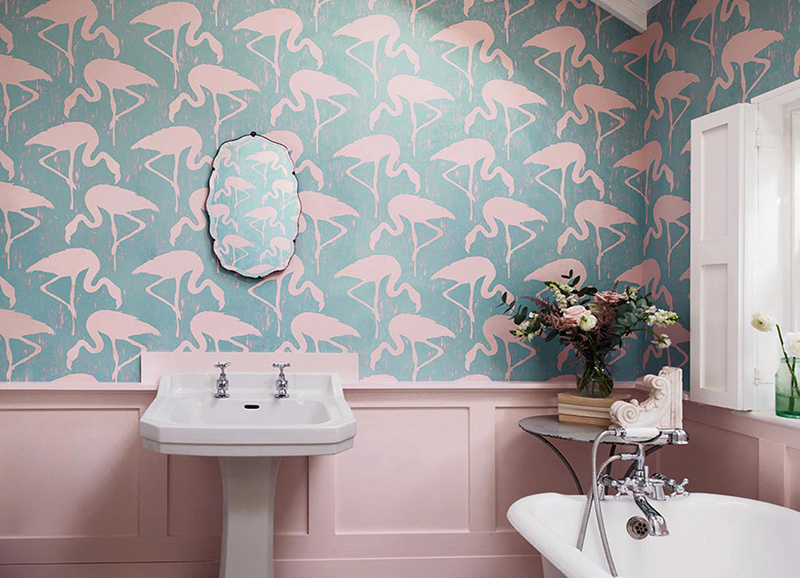 Give your bathroom a shabby-chic flair with this beautiful flamingos-inspired wallpaper in pastel turquoise and pink. 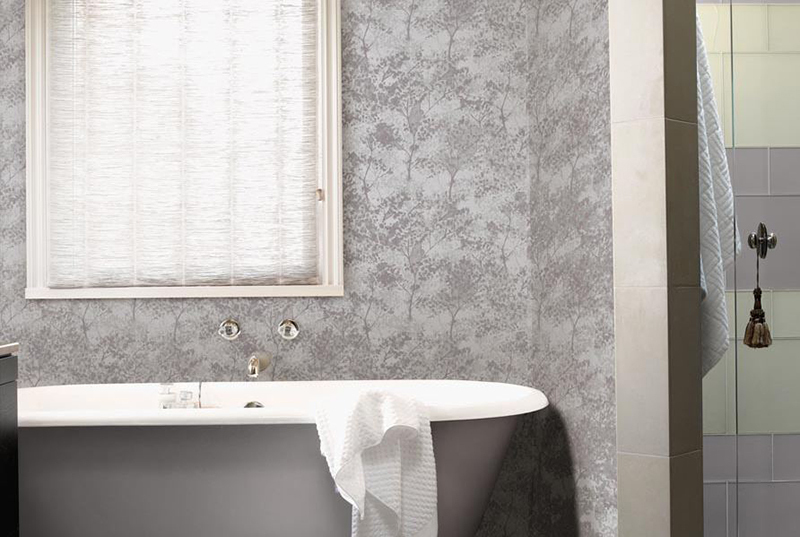 Add some whimsy and mystery to your bathroom with the help of this designer wallpaper in silver and mauve. It’s simple and elegant look will make your space charming and classy. 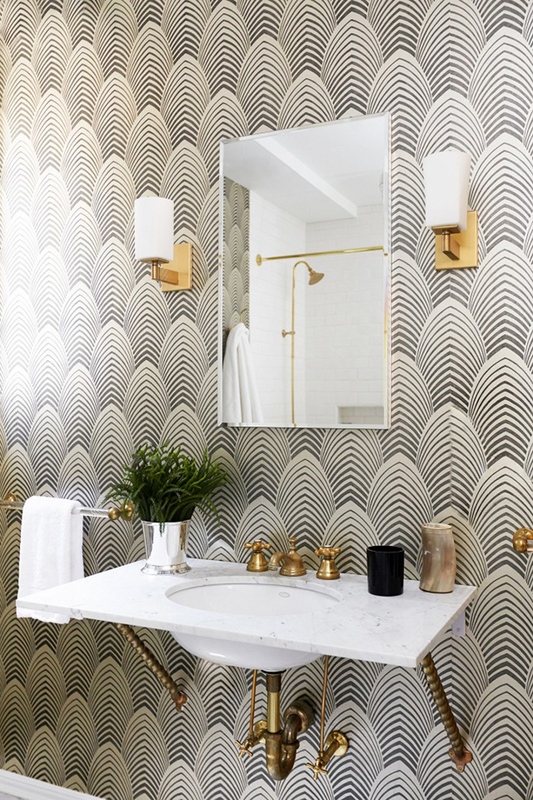 Take your bathroom up a notch by adding an art deco wallpaper and match it with antiqued brass faucet and fixtures to get an edgy and chic look. 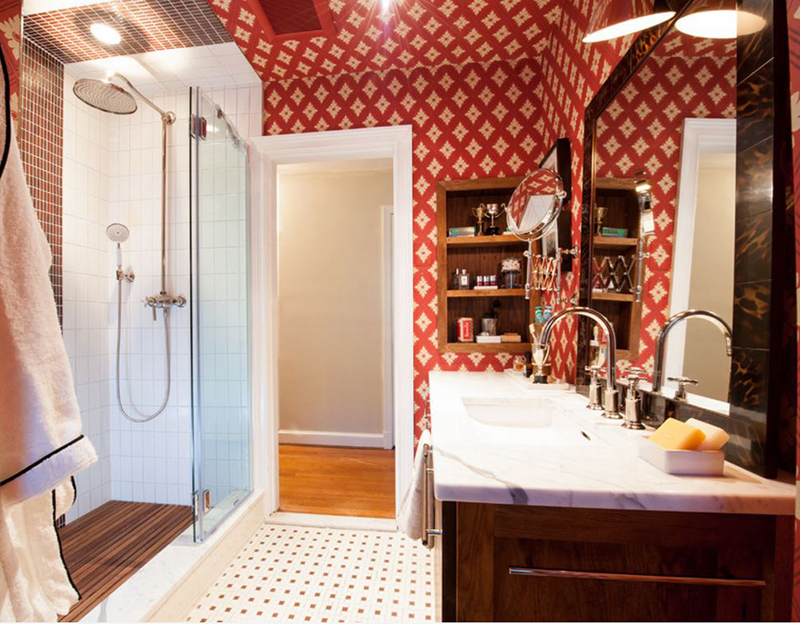 This bath won an honorable mention in an F. Schumacher contest using this beautiful wallpaper. The Cherry Blossom motif is a burnished metallic taupe color set against a soft aqua background. It gives an inviting and calming feel in the space. Give your bath a retro feel with this fun and vibrant wall covering. The brings an eclectic look that is bold and full of character. Add a sophisticated and unique touch to your bathroom with this colorful wallpaper. Its burst of colors and patterns will make a great statement for an accent wall for a feminine flair. 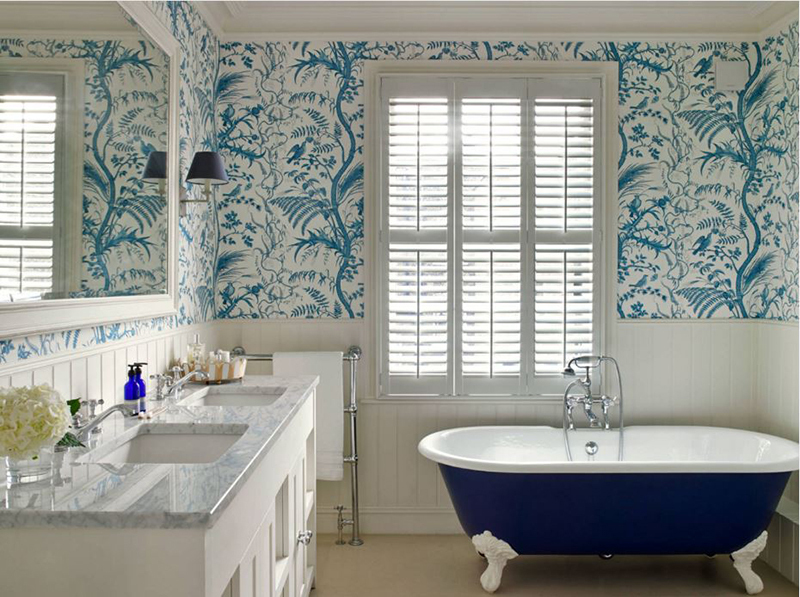 The soothing combination of blue print over the white background gives this bathroom a sweet, traditional elegance. I love the elegance, beautiful geometric design and the texture of this wallpaper. Its metallic finish adds luxury and sophistication to the whole space. 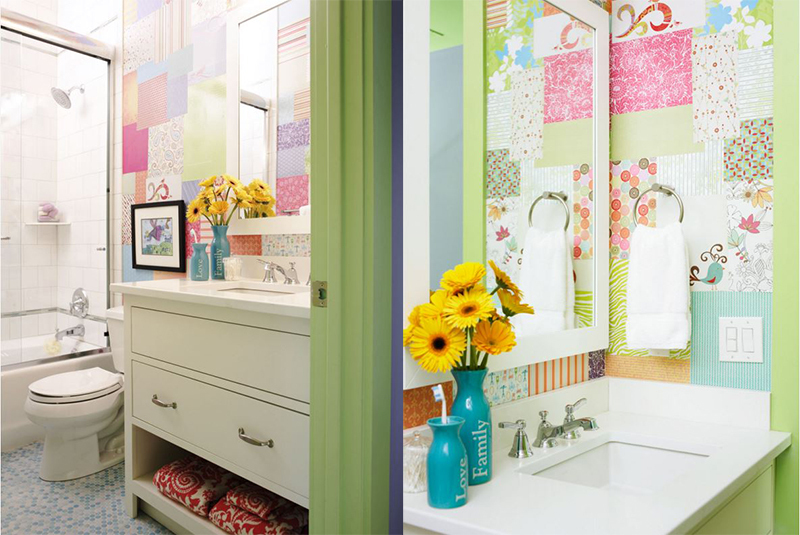 Make your little girl’s bath fun and lively with this whimsical wallpaper. Its charming patterns and attractive colors make her space adorable and never boring. This bathroom is absolutely gorgeous! The clean lines, crisp white walls and bathroom fixtures against the exuberant, lovely prints and colors of the wallpaper work magically. Let’s admit it, textured wallpapers are appealing and gives off a modern vibe. 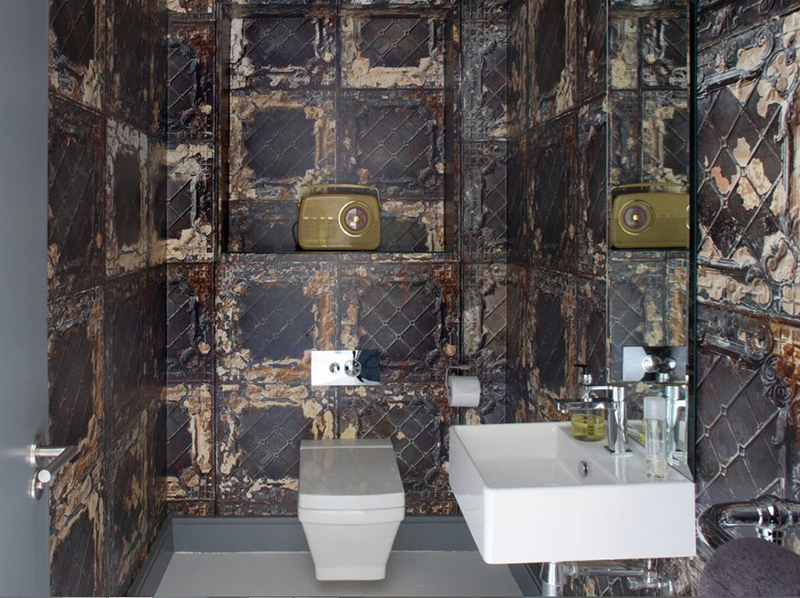 Create a luxurious style with the help of its modern tile effect with its sophisticated pearl ink and textured finish. Bring a refreshing and inviting atmosphere to your bath with this mint green wallpaper. It fabulously complement the white interiors and bathroom fixture giving a relaxing space. 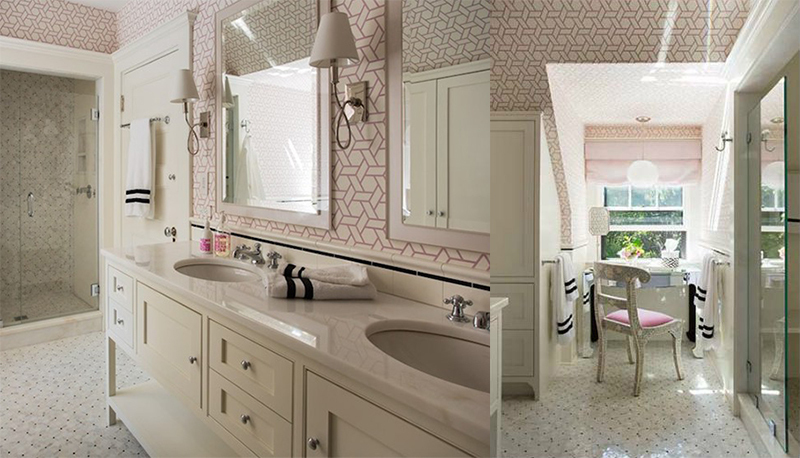 This pink geometric wallpaper exudes a feminine flair to this space. Its pattern gives personality and style that can be used in a child’s space or even in grown-ups. I enjoyed looking at those beautiful wallpapers and I know you do, too. 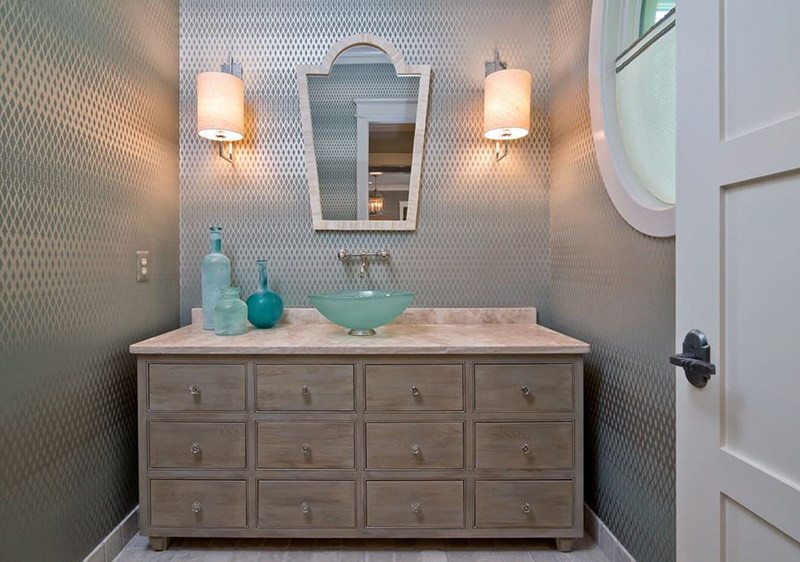 Those amazing designs, patterns and textures can also be used in different areas of your home. You see, wallpapers have evolved through time. It is not only limited to certain areas of your home but it is now used even in spaces like bathroom, powder room, even in kitchen areas. Using it is one of the easiest way to spruce up a small space. It is a great way to add a statement or an instant accent to any space. 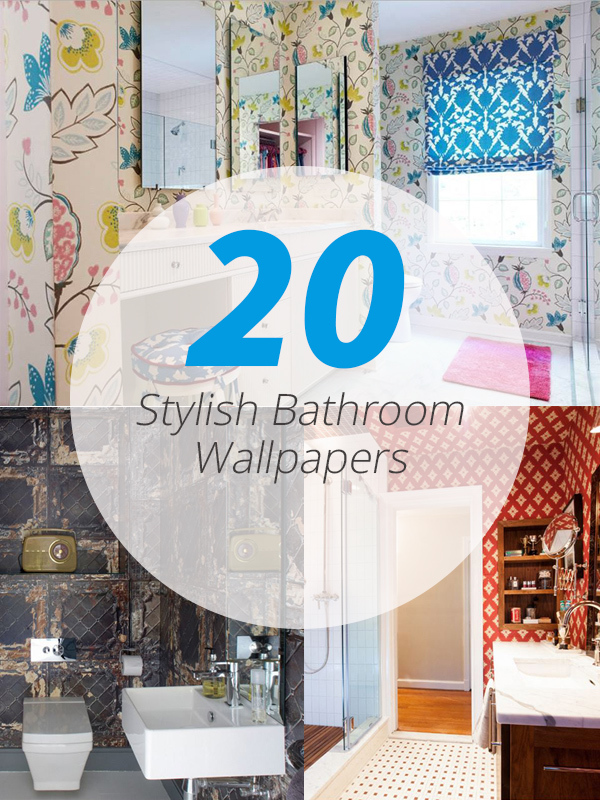 How stylish and lovely these 20 bathroom wallpapers are? Amongst the 20 bathroom designs, which style is your favorite? Let me know on the comments below.